View of Snowfox’s iPhone APP where you can track your kids’ locations. 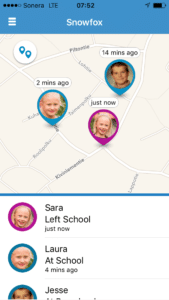 This kid tracking solution consists of a portable device with voice calling, GPS tracking and an app to help address the highest priority for any parent – their child’s safety. Snowfox will be presented in the Haltian booth (Hall 5 Stand 5C43) at Mobile World Congress, Barcelona on 22-25 February 2016. The devices will be commercially available in Q2 2016 in selected markets. This entry was posted in #Shopping, Raising Tweens, Technology, Videos and tagged Apps, child safety, kid tracker, raising tweens, snowfox. Bookmark the permalink.